The Jellyfish Nebula (IC 443, Sharpless 248) is a supernova remnant located in the constellation Gemini. It lies at an approximate distance of 5,000 light years from Earth and has an apparent magnitude of 12. 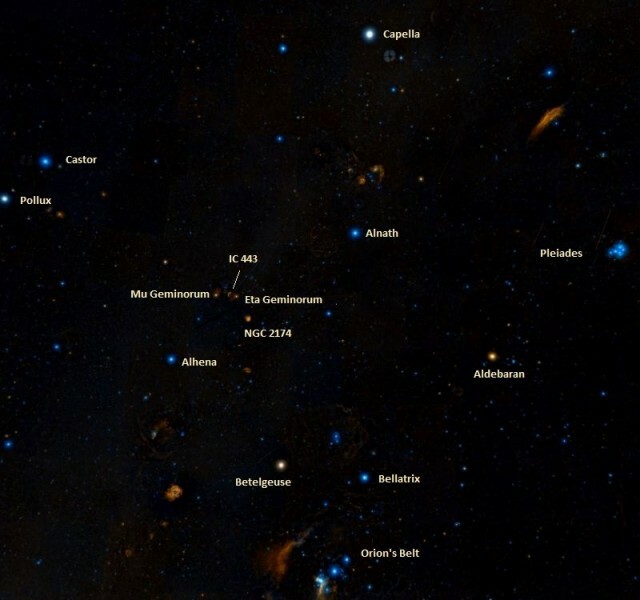 The nebula can be found between the stars Mu and Eta Geminorum, at the foot of one of the celestial Twins. 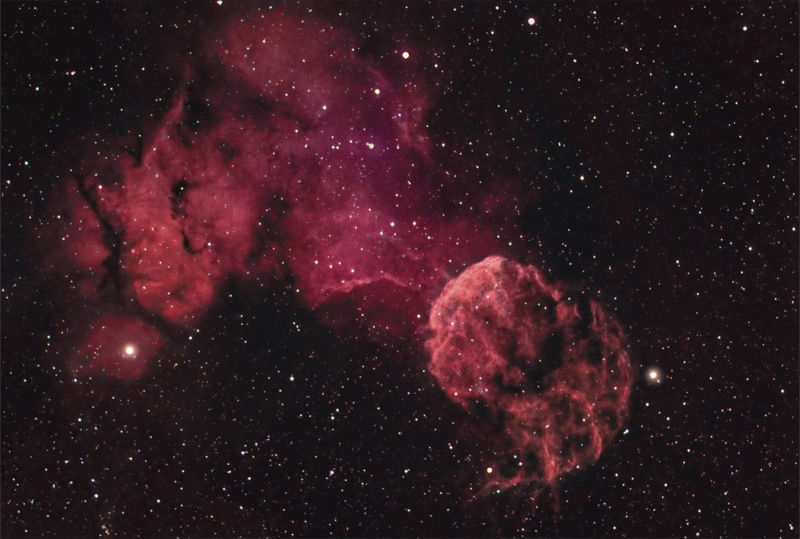 The Jellyfish Nebula is a remnant of a supernova that occurred in the Milky Way between 3,000 and 30,000 years ago. The supernova event produced the nebula and the neutron star CXOU J061705.3+222127. The presence of the neutron star and the nebula’s location in a star forming region indicate that the remnant was created by a Type II supernova, one triggered by a rapid collapse and violent explosion of a star with a mass at least 8 times that of the Sun. The neutron star is moving away from the site at about 800,000 km/h. The nebula occupies an area of 50 arcminutes, appearing larger than the full Moon. It has a spatial diameter of about 70 light years, or 20 parsecs. IC 443 is interacting with the surrounding molecular clouds and is one of the most studied supernova remnants in the sky. The remnant has evolved in the complex environment of the molecular cloud in which the progenitor star was still embedded when it ended its life. The interaction with the cloud has affected the nebula’s morphology. In the southeastern portion of the nebula, the molecular cloud is very dense and clumpy, and the nebula’s gas appears ring-like, while the northeastern part of the nebula is interacting with a wall of neutral hydrogen, a considerably less dense environment that allows the shock to travel at a much higher velocity. The nebula’s expansion to the west is exaggerated, while the expansion to the east is experiencing a compression effect. In optical and radio wavelengths, the nebula appears shell-like and is composed of two sub-shells with different radii, emissions and centres. The larger northeastern shell was likely created by a shock wave travelling at about 100 km/s. 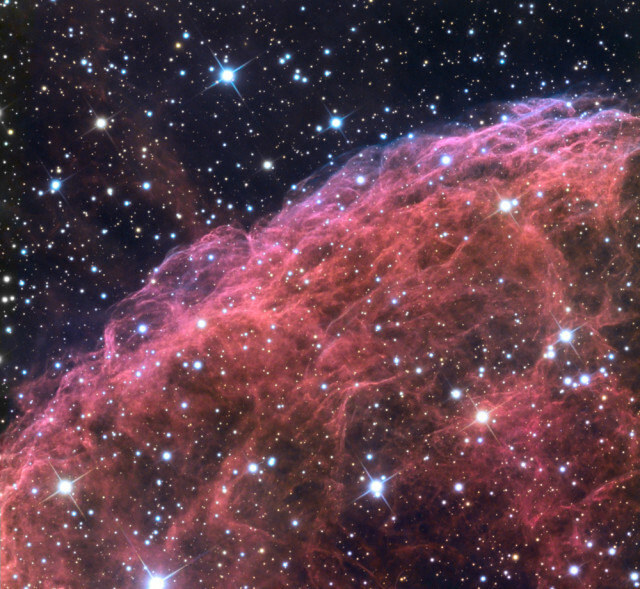 It consists of complex filaments that are emitting light from iron, neon, silicon and oxygen atoms and dust particles, which are heated by the blast from the supernova event. The smaller southern shell, which was probably created by a shock wave moving at about 30 km/s, is composed of denser clumps that emit light mainly from hydrogen gas and hot dust. There is a third shell which is larger but, even though it was once believed to be part of the Jellyfish Nebula, it is now known to be older, with an estimated age of about 100,000 years. 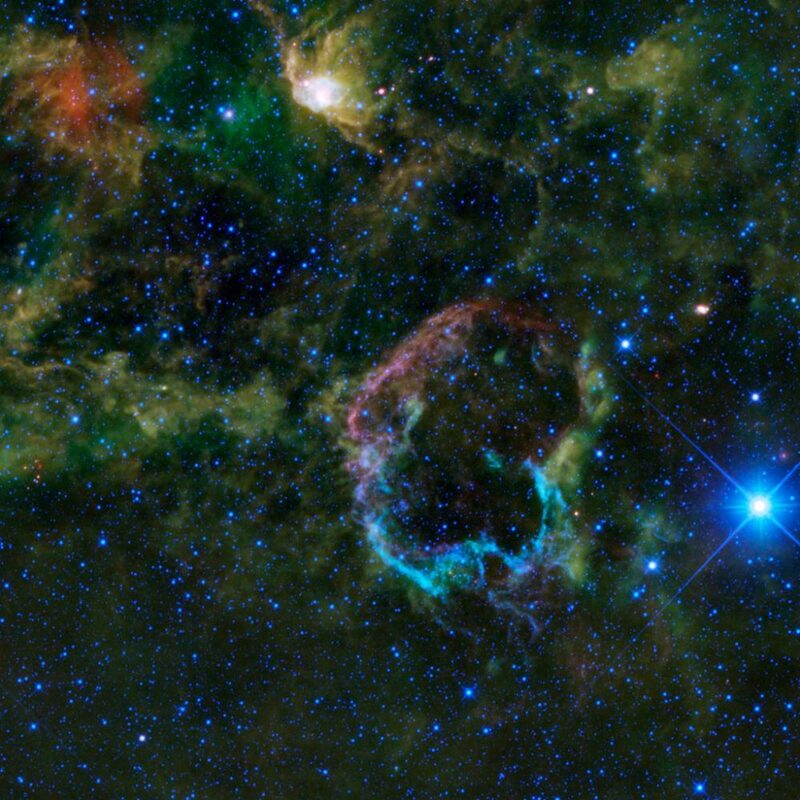 The larger shell is part of a different supernova remnant, designated as G189.6+3.3. 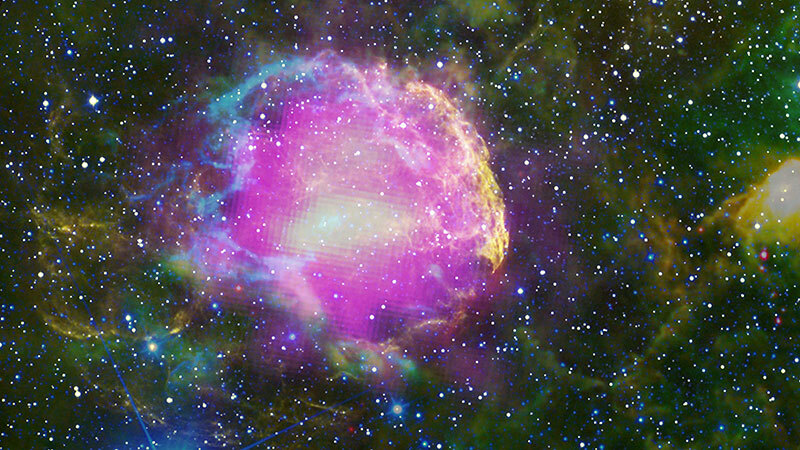 X-ray images reveal the nebula as centrally peaked, with a barely visible soft X-ray shell. In both optical and X-ray wavelengths, nebula’s emission is heavily absorbed by a huge molecular cloud located in the foreground. The cloud crosses the entire nebula from northwest to southeast. Observations with the Chandra X-ray Observatory and XMM-Newton have revealed a plerion nebula near the southern edge of the supernova remnant. A plerion, or pulsar wind nebula, is a nebula powered by the wind of a pulsar, a highly magnetized, rotating neutron star that emits electromagnetic radiation. Pulsar winds consist of charged particles that are accelerated to relativistic speed by the rapidly rotating, extremely strong magnetic field of the spinning pulsar. The Crab Nebula (Messier 1) is a prototype of this class of nebulae.